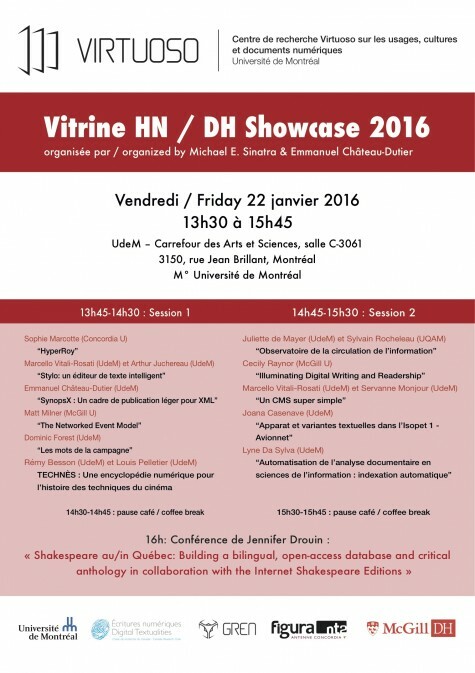 For the 4th edition of the Vitrine HN / DH Showcase, the organizers invite proposals (in English or French) for demonstration of digital humanities projects and tools. These projects could be, for instance, databases, text mining and data visualization tools, electronic publications, or mobile applications. Two sessions with 5 or 6 demonstrations are planned. Each presenter will first have 3 minutes to present an overview of their project to the whole group, before fielding questions about their projects as audience members circulate among the projects displayed on presenters’ individual laptops. Food and drinks will be served. The event will take place between 1.30 p.m. and 3.45 p.m. in room C-3061 of Carrefour des Arts et Sciences at the Université de Montréal (3150 rue Jean Brillant, métro Université de Montréal). It will be followed at 4 p.m. with a lecture by Jennifer Drouin (« Shakespeare au/in Québec: Building a bilingual, open-access database and critical anthology in collaboration with the Internet Shakespeare Editions »). The 2016 Vitrine HN / DH Showcase is made possible by the support of the Faculté des Arts et des Sciences de l’Université de Montréal. This event is organized in association with le Département de littératures et de langues du monde, le CRIHN, le Centre Virtuoso, le Laboratoire NT2-Concordia, le groupe McGill Digital Humanities de l’Université McGill et la Chaire de Recherche du Canada sur les écritures numériques. This content has been updated on January 19, 2016 at 18 h 43 min.